This video demonstrates how to strip cable. Using a utility knife, stripping the jacket from PVC cable (Romex or Loomex) is shown as one method for how to strip cable. 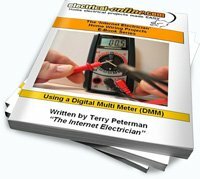 Using the proper technique, stripping wire can be easy, as demonstrated by Terry Peterman, the Internet Electrician. This entry was posted in How-To-Videos, Videos and tagged cable, house wire, jacketed cable, Loomex, Romex, wire. Bookmark the permalink.